In addition to the celebration of the Annunciation, there are three major feasts in the Church honoring the Ever-Virgin Mary, the Theotokos. The first of these is the feast of her Nativity which is kept on the 8th of September. The record of the birth of the Mother of God is not found in the Holy Bible. The traditional account of the event is taken from the Apocryphal writings which are not part of the New Testament Scriptures. The traditional teaching which is celebrated in the hymns and verses of the festal Divine Liturgy is that Saints Joachim and Anna were a pious Jewish couple who were among the small and faithful remnant-- "the poor and the needy" --who were awaiting the promised Messiah. The couple was old and childless. They prayed earnestly to the Lord for a child, since among the Jews barrenness was a sign of God's disfavor. In answer to their prayers, and as the reward of their unwavering fidelity to God, the elderly couple was blessed with the child who was destined, because of her own personal goodness and holiness, to become the Mother of the Messiah-Christ. The fact that there is no Biblical verification of the facts of the Ever-Virgin Mary's birth is incidental to the meaning of the feast. Even if the actual background of the event as celebrated in the Church is questionable from an historical point of view, the divine meaning of it "for us men and for our salvation" is obvious. There had to be one born of human flesh and blood who would be spiritually capable of being the Mother of Christ, and she herself had to be born into the world of persons who were spiritually capable of being her parents. The feast of the Holy Nativity of the Theotokos, therefore, is a glorification of Mary's birth, of Mary herself and of her righteous parents. It is a celebration as well of the very first preparation of the salvation of the world. For the "Vessel of Light," the "Book of the Logos/Word of Life," the "Door to the Orient," the "Throne of Wisdom" is being prepared on earth by God Himself in the birth of the holy girl-child Mary. The verses of the feast are filled with titles for Mary such as those in the quotations above. They are inspired by the message of the Holy Bible, both the Old and New Testaments. The specific Biblical readings of the feast give indications of this. At Vespers Service the three Old Testament readings are "Mariological" in their New Testament interpretation. Thus, Jacob's Ladder which unites heaven and earth and the place which is named "the House of God" and the "Gate of Heaven" (Genesis 28:10-17) are taken, to indicate the union of God with men which is realized most fully and perfectly--both spiritually and physically--in Mary the Theotokos, Bearer of God. So also the vision of the temple with the "door to the East" perpetually closed and filled with the "Glory of the Lord" symbolizes Mary, called in the hymns of the feast "the Living Temple of God with the Divine Glory" (Ezek. 43:27-44.4). Mary is also identified with the "House" which the Divine Wisdom has built for Himself according to the reading from Proverbs 9:1-11. The Gospel reading of Orthros (Matins) is the one read at all feasts of the Theotokos, the famous Magnificat from Saint Luke in which Mary says: "My soul magnifies the Lord and my spirit rejoices in God my Savior, for He has regarded the low estate of His handmaiden, for behold, henceforth all generations will call be Blessed" (St. Luke 1:47). 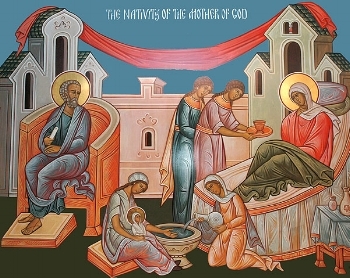 The Epistle reading of the Divine Liturgy is the famous passage about the coming of the Son of God in "the form of a servant, being born in the likeness of man" (Phil. 2:5-11) and the Gospel reading is that which is always read for feasts of the Theotokos--the woman in the crowd glorifies the Mother of Jesus, and the Lord Himself responds that he same blessedness which His mother receives is for all "who hear the word of God and keep it" (St. Luke 11:27-28). Today, God Who rests upon the noetic thrones has prepared a holy throne for Himself upon the earth. He Who established the heavens in wisdom had prepared an animate heaven, in His love for mankind. For from a fruitless root, He raised for us a Life-bearing plant, His Mother. God of wonders and the hope of the hopeless, Lord, glory to Thee. This is the Lord's Day, O people, be filled with gladness! Behold! The bridal chamber of Light and the book of the Logos/Word of Life has come forth from the womb. The Temple Gate that faces east has been born, and she awaits the entry of the Great High Priest. Only she introduces only Christ to the whole world, for the salvation of our souls. Although by God's will other barren offspring, Yet among those children/Mary shines brightest with Divine glory./Born wondrously herself of a barren mother,/she bore in the flesh the God of All,/in a manner surpassing nature, / from a womb without seed./She is the single gateway of the Only-Begotten Son of God,/Who passed through this gate yet kept it sealed./And having ordered all things in His own wisdom/has wrought salvation for all mankind! O Virgin, today you were born a most noble child, from the two just ones, Joachim and Anna, as the Angel had promised in his announcement. To God you are heaven, a Throne and a Vessel of Holiness. The whole world, a herald of joy, the cause of our life, the blessing that wiped out the curse. You are the reason for all the blessings of God. O Maiden, whom God has chosen, on this day of your nativity obtain peace and great mercy for our souls.